A 4-year-old child was brought to the Pediatric Emergency department with a history of fever and muscle spasms since 1 week. He was in altered sensorium since 1 day. He also had bilateral otorrhea since 6 months of age. Otorrhea was copious, foul smelling, non-blood stained. Ear discharge was increasing on entry of water in to the ear and during upper respiratory tract infection. Ear discharge subsided with topical and systemic antibiotics. On examination, there was ear discharge filling both the external auditory canals which foul smelling and non-blood stained. Pus was taken for culture and sensitivity. Dry mopping of both the ears was done. Right tympanic membrane showed a small central perforation. There was a central perforation involving anteroinferior and anterosuperior quadrant on left side. Middle ear mucosa was congested. Since he developed respiratory distress, he was intubated. With a provisional diagnosis of tetanus, he was admitted in intensive care unit by the pediatrician and managed accordingly. On day 2 of admission, during routine ear examination, we found a worm in the left external auditory canal. The worm was partly in the middle ear cavity and partly in the external auditory canal. The worm was cream colored. The worm was gently held using aural forceps and pulled out of the ear [Figure 1]. It was sent to the microbiology lab for identification. The worm was identified as Ascaris lumbricoides. It was measuring 13 cm in length. The worm was seen wriggling in the container [Figure 2]. Foreign bodies in the external ear are most frequent in otolaryngological practice. Numerous foreign bodies have been reported so far in the ear of the children. Roundworm crawling out of the middle ear cavity is rare and fascinating. Migration of the adult worm up the Eustachian tube More Details into the middle ear is very rare but it has been documented. , The anatomic explanation for its presence in the middle ear cavity is, when either during vomiting, or ascending of A. lumbricoides in to the oral cavity or nasopharynx, the worm enters Eustachian tube. In children, the Eustachian tube is shorter, wider and horizontal so it may be possible for a migrating worm to enter it. Our child had no episode of vomiting after hospitalization. There is a possibility of the worm blocking the Eustachian tube and there by leading to the recurrent episodes of ear discharge. The worm had made its way out of the middle ear cavity through the perforation. 1. Figueiredo RR, Azevedo AA, Kós AO, Tomita S. Complications of ent foreign bodies: A retrospective study. Braz J Otorhinolaryngol 2008;74:7-15. 2. Schulze SL, Kerschner J, Beste D. Pediatric external auditory canal foreign bodies: A review of 698 cases. Otolaryngol Head Neck Surg 2002;127:73-8. 3. Gradwohl RB, Kourr P. Parasitology in Tropical Medicine: Clinical Laboratory Methods and Diagnosis. 4 th ed., Vol. 3. St. Louis: CV Mosby; 1948. p. 296. 4. Howard BJ. Clinical and Pathogenic Microbiology. 2 nd ed. St. Louis: Mosby Year Book Inc.; 1994. p. 669. 5. Maqbool M. Ascaris lumbricoides in the middle ear cavity. Indian J Otolaryngol 1975;27:109-10. 6. 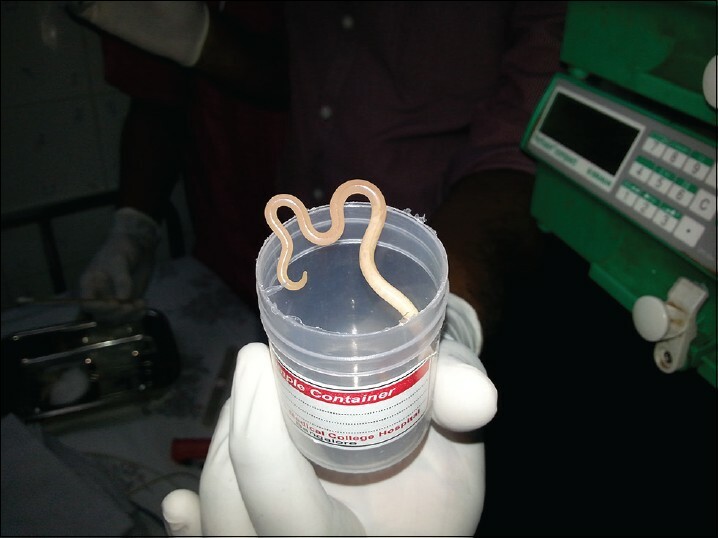 Goyal A, Vishwakarma SK, Kumar R. Abnormal migration of ascaris into the middle ear. Indian J Pediatr 1998;65:147-8. 7. Fornazierie MA, Cutolo D, Moreira JH, Navarro PL, Takemoto LE, Heshiki RE, et al. Foreign-body in external auditory meatus: Evaluation of 462 cases. Int Arch Otolarynogol 2010;14:45-9.